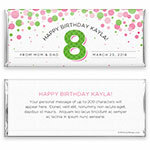 A shower of colorful confetti makes this wrapper perfect for a birthday or any special celebration. Design: Pink and green confetti with a large number. Personalization: Front number, names and date with back title and message.